(Nanowerk News) Princeton University researchers have built a rice grain-sized laser powered by single electrons tunneling through artificial atoms known as quantum dots. The tiny microwave laser, or "maser," is a demonstration of the fundamental interactions between light and moving electrons. The researchers built the device -- which uses about one-billionth the electric current needed to power a hair dryer -- while exploring how to use quantum dots, which are bits of semiconductor material that act like single atoms, as components for quantum computers. "It is basically as small as you can go with these single-electron devices," said Jason Petta, an associate professor of physics at Princeton who led the study, which was published in the journal Science ("Semiconductor double quantum dot micromaser"). The device demonstrates a major step forward for efforts to build quantum-computing systems out of semiconductor materials, according to co-author and collaborator Jacob Taylor, an adjunct assistant professor at the Joint Quantum Institute, University of Maryland-National Institute of Standards and Technology. "I consider this to be a really important result for our long-term goal, which is entanglement between quantum bits in semiconductor-based devices," Taylor said. The original aim of the project was not to build a maser, but to explore how to use double quantum dots -- which are two quantum dots joined together -- as quantum bits, or qubits, the basic units of information in quantum computers. "The goal was to get the double quantum dots to communicate with each other," said Yinyu Liu, a physics graduate student in Petta's lab. The team also included graduate student Jiri Stehlik and associate research scholar Christopher Eichler in Princeton's Department of Physics, as well as postdoctoral researcher Michael Gullans of the Joint Quantum Institute. Because quantum dots can communicate through the entanglement of light particles, or photons, the researchers designed dots that emit photons when single electrons leap from a higher energy level to a lower energy level to cross the double dot. Each double quantum dot can only transfer one electron at a time, Petta explained. "It is like a line of people crossing a wide stream by leaping onto a rock so small that it can only hold one person," he said. "They are forced to cross the stream one at a time. These double quantum dots are zero-dimensional as far as the electrons are concerned -- they are trapped in all three spatial dimensions." 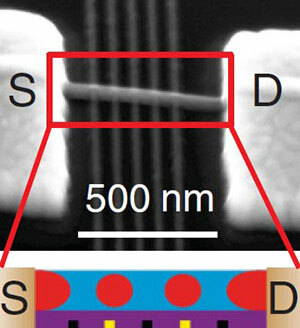 The researchers fabricated the double quantum dots from extremely thin nanowires (about 50 nanometers, or a billionth of a meter, in diameter) made of a semiconductor material called indium arsenide. They patterned the indium arsenide wires over other even smaller metal wires that act as gate electrodes, which control the energy levels in the dots. To construct the maser, they placed the two double dots about 6 millimeters apart in a cavity made of a superconducting material, niobium, which requires a temperature near absolute zero, around minus 459 degrees Fahrenheit. "This is the first time that the team at Princeton has demonstrated that there is a connection between two double quantum dots separated by nearly a centimeter, a substantial distance," Taylor said. When the device was switched on, electrons flowed single-file through each double quantum dot, causing them to emit photons in the microwave region of the spectrum. These photons then bounced off mirrors at each end of the cavity to build into a coherent beam of microwave light. One advantage of the new maser is that the energy levels inside the dots can be fine-tuned to produce light at other frequencies, which cannot be done with other semiconductor lasers in which the frequency is fixed during manufacturing, Petta said. The larger the energy difference between the two levels, the higher the frequency of light emitted. Claire Gmachl, who was not involved in the research and is Princeton's Eugene Higgins Professor of Electrical Engineering and a pioneer in the field of semiconductor lasers, said that because lasers, masers and other forms of coherent light sources are used in communications, sensing, medicine and many other aspects of modern life, the study is an important one. "In this paper the researchers dig down deep into the fundamental interaction between light and the moving electron," Gmachl said. "The double quantum dot allows them full control over the motion of even a single electron, and in return they show how the coherent microwave field is created and amplified. Learning to control these fundamental light-matter interaction processes will help in the future development of light sources."